Exports: Does lowering the price to capture market share work in the grain markets? Exports tend to have a “be all” persona in the grain sector. Seldom do you see projections, especially long-term projections, of the financial health of the grain sector that are not linked directly to export prospects – often of the optimistic kind. The expressed message: Exports are the key. The subliminal message: Exports will be increasing real soon now. But is the hype the reality? Well, as we saw in two recent columns, exports of the three major crops have been summarily unimpressive over the last two decades. So, in a world of “What have you done for me lately,” crop exports would have to hang their collective heads. Ok, so exports have been flat-to-declining for U.S. corn, wheat and soybeans. Maybe world exports are flat or declining too, allowing the U.S. to maintain or even increase our share of world exports. That is possible, I suppose. In this column we will specifically look at the export share question for corn. It is important to mention at the outset that the decline in the U.S. share of world crop exports in the early-to-mid 1980s was one of the motivating factors for including several export enhancing provisions in the 1985 Farm Bill. For example, support prices were reduced by about one-quarter initially and, in the case of corn, by nearly forty percent by 1990 using a combination of moving averages of market prices and discretion of the Secretary of Agriculture. Now, with the implementation of the loan deficiency payment program (LDP), support prices no longer support prices; their current major use is to determine LDP rates. The reasoning was that by allowing prices for program crops to fall, U.S. crops would be more price competitive. This would cause the U.S. export share to increase as importers purchase more from us and less from other suppliers. In turn, our export competitors would respond to the lower prices by devoting fewer resources to agriculture and producing less for the export market. So the questions are: Has the lowering of prices over the last two decades caused the U.S. share of corn exports to trend upward? And, in those years in which the corn price is low, does the U.S. share of world corn exports usually spurt upward? Let’s look at the data. Figure 1 shows U.S. export volume as a percentage of world export volume for corn. While there is significant year-to-year variation, the trend is downward. For comparison purposes, average percentage shares were computed for three time periods: the ten years prior to the 1985 Farm Bill, the ten years after the 1985 Farm Bill (covers the 1985 and 1990 Bills), and the first four years of the 1996 Farm Bill. With corn (Figure 1), the overall downward trend in the U.S. share of the world export market is evidenced by the 70, 66, and 60 percent average shares for successive periods. Having answered the first question we can move on to the second one. Looking year-to-year, the dips in market share in 1985, 1993, and 1997 are especially sharp and occur under widely different U.S. production and price conditions. 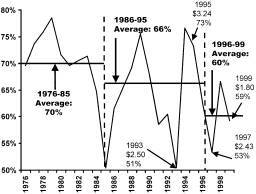 In the 1985 marketing year, the U.S. experienced record level corn production and the price averaged $2.23, 40 cents below the previous year. Meanwhile the U.S. share of world corn exports dropped to 51 percent from 65 percent in 1984. Similar U.S. circumstances surrounded the drop in market share in 1997. In 1993, on the other hand, U.S. corn yield and production were down significantly from the past, the corn price was $2.50, about 40 cents higher than the previous year, and the U.S. export share dropped. But two years later, in 1995, the corn season average price was a record high at $3.24 per bushel and the U.S. share of the corn export market jumped by over 20 percentage points to 73%. While price is always a factor, it is evident that other events in a given year, especially yield-determined production levels of our export competitors and export customers, are of considerable importance. Over the last 24 years, U.S. attempts to capture a greater share of the world corn market by lowering price have not worked as the average share has dropped by ten percentage points. In next week’s column we will look at what has happened to soybeans and wheat over the same time periods.